No Continuing City | A varied collection of thoughts and comments by A J King. What in the world is going on? Catastrophic hurricanes, earthquakes, floods, terrorism, nuclear threats. Is God trying to tell us something? Yes. UPDATED: What in the world is going on? Hurricane Harvey drops 33 trillion gallons of rainfall on the U.S. Experts say the floods are a once-in-a-thousand-years event. Now Hurricane Irma is bearing down on Florida. Historic, sustained winds of at least 185 miles-per-hour. Devastation in the Caribbean has been catastrophic. Experts say Florida and other American states could face the same. Then there’s the horrific, out-of-control wildfires raging across the Pacific Northwest Countless that are “creating apocalypse-like conditions in numerous Western states, blotting out the noonday sun behind thick blankets of smoke and depositing ash like freshly fallen snow,”according to the Washington Post. Written in prophecy in the Old Testament Scriptures and in biography in the four Gospels is the narrative account of the life of Jesus of Nazareth, the Christ of GOD. There is only one Man in the history of mankind that has had exact details given in public documents centuries before His birth that describe His birth, death, and resurrection. No one who gives careful attention to and investigation of the historical record can challenge the fact that these documents were circulated before his birth, especially as the Old Testament Scriptures predate the birth and ministry of Jesus by several hundred years. Sometimes I wake up with a deep and clear line of thinking going on in my subconscious. It’s funny what can trigger it off. A few weeks ago I was browsing on Twitter and came across a photo of an old friend of mine from our church youth days, Paul Counsell. He was pictured with his 6mth old grandson and in the caption he was called Grandad. It made me smile and brought back many happy memories of what was a truly superb youth group back in the late 70’s at the Full Gospel Church on Pasture St in Grimsby. As I woke up the following morning I found myself going over the memories from the church and youth group, and just feeling so appreciative of the Godly input I had received in those early days as a believer. The pastor of the church, Glyn Thomas, and the secretary, Bill Counsell, were two wonderful men of God from whom I learned so much. Glyn had a very down to earth approach to Christian living and a great sense of humour. I remember one time there was a visitor in the meeting and they had brought a rather unsound ‘message in tongues’. It actually sounded like a chicken rather than a distinctive tongue. There was quite a bit of smothered merriment as we tried not to laugh out loud during the prayer meeting. Pastor Thomas handled it brilliantly by concluding saying (as I remember), “Well friends, all I can say is, as a hen gathers her chicks, so the Lord gathers us!” Of course we all burst out laughing, but that was indicative of his easy and witty style. I learned so much from him. And I can still hear Mr Counsell relating stories from his own youth under the ministry of his old pastor from Blackburn assembly. Many a time he would say, “As old Fred Watson used to say…..”. Bill took the time to run a Bible class for us youngsters after the main Sunday morning service, and over a coffee we would raise our questions and he would lead an in-depth discussion of the subject matter. His intention was to pass on his experiences and learning and imbue us with the same solid Biblical background he had received himself. The legacy of these two men of God in those first few months and years of my Christian life has been tremendous. I often thank God for the godly grounding I received from them, and how much it has helped me in my walk with the Lord these past 38 years. I didn’t really realise it at the time but they left a heritage in my life which I believe is still bearing fruit all these years later. Of course there were others who contributed greatly to my early growth as a young believer. Alan and Chris Leeman used to host the young people at their house after many a Sunday night service. We loved the fellowship and food, and Alan and others would share from the Word a thought or a message to help us. Also, in the year before I left my hometown for Manchester Polytechnic I was also greatly mentored by Jo Hall and Linda Cawkwell (now Ng), in particular with regard to youth work and Youth for Christ activities in the area. And only last week, I was reminded of how important is the legacy we all leave behind by attending the funeral of Phil and Jean Wooffindin. The testimonies of the input they had into the lives of many people were wonderful to hear. They are a precious couple who will be sadly missed by many. Prime Minister Netanyahu earned his keep in Paris yesterday. 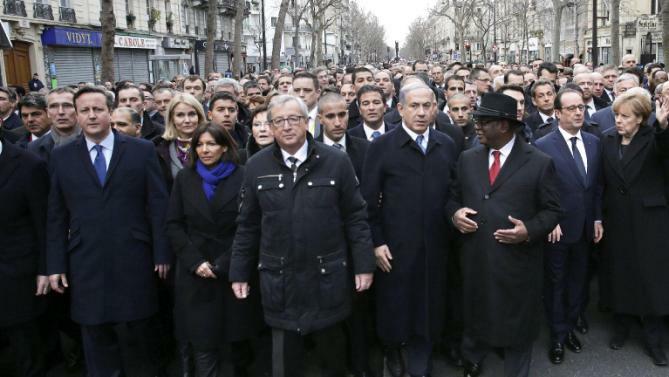 According to an incredibly hostile report last night by Channel 2, the French tried to prevent Netanyahu from participating in the rally yesterday in Paris, claiming that having him march with other leaders would detract from the message of unity in the fight against terrorism. It’s possible that the French had no idea how offensive their position is, treating the frontline state in the war against the global jihad as a leper. But there is a lot of that going around these days. Let us not forget that the French voted in favor of the Palestinian statehood resolution at the UN Security Council in an act of aggression against Israel and the US and the struggle against global jihad. For them, and for a growing number of Jew haters in Europe and distressingly in the US, terrorism involves the murder of non-Jews for political purposes. Defying their prejudiced position, Netanyahu insisted that Israel not be cast aside and was willing even to have the media terrorizing terrorist Mahmoud Abbas march in the parade in order to ensure that Israel would be properly represented. Then, to add insult to injury, the French tried to prevent Netanyahu from travelling in the same bus as the other world leaders and wanted to shove him into bus #2 with their hired help. He had none of it. So they made him wait outside the bus, exposed to assassin fire for long moments before they finally agreed to treat Israel’s leader with respect. Then they tried to force him into the cheap seats at the march, pushing him into the second row to hide him. Here too, he had none of it and found an elegant way of pushing back. And thank God he did. As the videos in the attached story show, for the Jews of France, Netanyahu’s presence was a cathartic experience. It was essential for their mourning process and for soothing their fears for their future. They greeted him — and through him Israel — as their champion, as the person they can depend on in their moment of need. In Channel 2’s coverage last night, they told the story through hateful French eyes — a story of a pushy, impolite Israeli leader who forced himself on the poor French in contravention of diplomatic practice. They gave less than 5 seconds of coverage of his reception at Paris’s Great Synagogue. They hid from the public the glaring fact that normal diplomatic practice, particularly in France, involves humiliating and condemning the Jewish state. By denying the public the knowledge of how profoundly Netanyahu’s presence touched the Jews of France, as witnessed by their calls to him during the march, and then more evocatively at the synagogue, they hid from us the basic truth of our country. Israel is the savior, the port in the storm for the Jewish people. It is our privilege and our duty. Every Israeli deserves to understand that. And by hiding the truth while demeaning Netanyahu’s refusal to be cowed as so much Israeli pushiness and bad manners, Channel 2 failed the public. I know we know it anyway, but it was painful and infuriating to watch all the same. As we go into the new year, the sons of Issachar are a great example for us to learn from. In 1Chron.12:32 we read they understood the times in which they lived and knew what they had to do. So too we need to understand our times and know what we need to do. We shouldn’t be surprised at the trouble that is coming upon the world. The Bible clearly states the last days will be times of severe distress. Jesus said in John 16:33 that in the world we will have trouble, but that He has overcome the world. In the Amplified version it reads: “I have told you these things so that in me you may have perfect peace and confidence. In the world you have tribulation and trials and distress and frustration; but be of good cheer (take courage, be confident, certain, undaunted) for I have overcome the world. (I have deprived it of power to harm you and have conquered it for you). These are amazing statements! Here we see the Lord Himself define eternal life as knowing Him, and we see Him actually refusing people entry into the Kingdom of Heaven on the basis that He did not know them. These were people who thought their works qualified them to enter in. Looking at the Scriptures above, I believe the most important thing for us, in all our doings, all our works, our ministries, our jobs, whatever they may be, the single most important thing is to know Him. 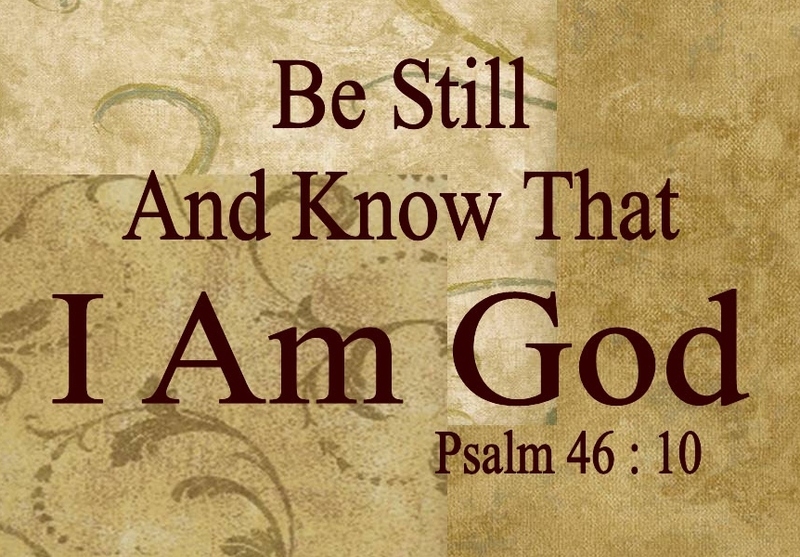 Not just to know about Him, but to actually know Him as our Lord, our God, our Guide and our daily Friend. Are we, nearer to the Lord now than this time last year? The good news is that, in James 4:8, God promises us that if we draw near to Him He will draw near to us. As we do that we will live (abide) in Him and His Word will live in us (John:15:7) and we will experience that life in the Spirit that liberates us from a life of tick-box obedience, (Romans 8, Col.2:20-23). The daily life of walking with the Lord in the Spirit is what people actually want and need to see in us, as opposed to a life of self-righteous religiosity. And as we press on to know the Lord then the more like Him we will become, and so we will be effective servants of the Lord in these troubled times. As Transportation Commissioners go, Janette Sadik-Khan is now my favourite! Excellent video of how New York’s streets have been altered to accomodate people and cycling more. 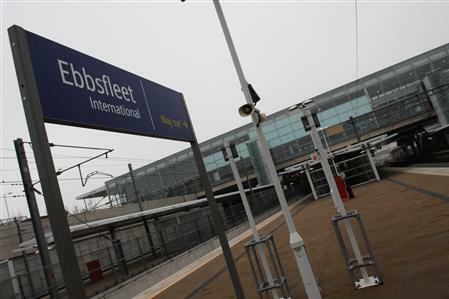 It has been announced that Ebbsfleet in Kent will become the first garden city development in Britain for 100 years. The development of a new generation of garden cities provides all sorts of opportunities to key into the latest thinking on urban development, including incorporating space for cycling. Designing the new garden cities around the bike, rather than the car, will result in huge benefits in terms of health, air pollution and noise pollution, and would create a generally more pleasant environment in which to live. There already is a station on the high speed line from London to Europe there, so it’s probable this development has been coming for some time. 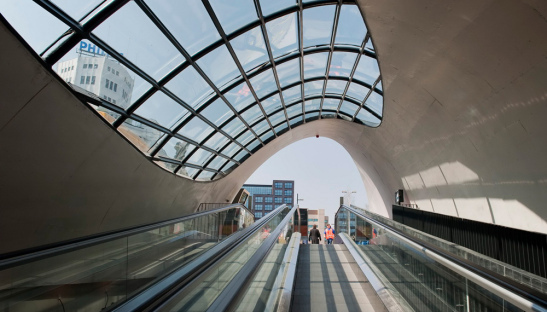 Good rail connections will fit perfectly with a properly integrated cycling network, such as those in Malmo in Sweden and Eindhoven in The Netherlands. There you can cycle from home on separated cycle lanes to the rail station, park your bike in excellent facilities and then travel onwards by train. 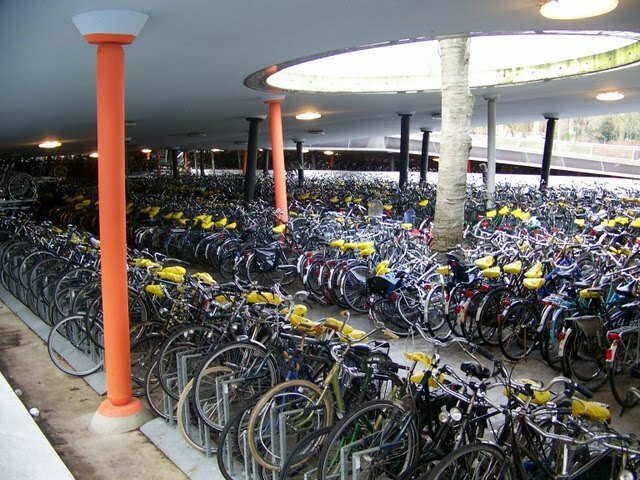 The entrance to the cycling parking at Eindhoven rail station. It also provides opportunity for developments such as Bjarke Ingels innovative 8 House in Copenhagen, which includes a gently-ramped cycleway linking all the apartments within the development. Let’s hope that some of the creative architecture displayed by British architects all over London in recent years will also be harnessed in building these new garden cities, building a better place for people to live. That has to include cycling as an integral part of the urban design.